Raising over $100,000 to complete the fundraising for the interpretive trail connecting the Gettysburg National Military Park Museum and Visitor Center to the George Spangler Farm Civil War Field Hospital Site with a spur to Powers Hill. 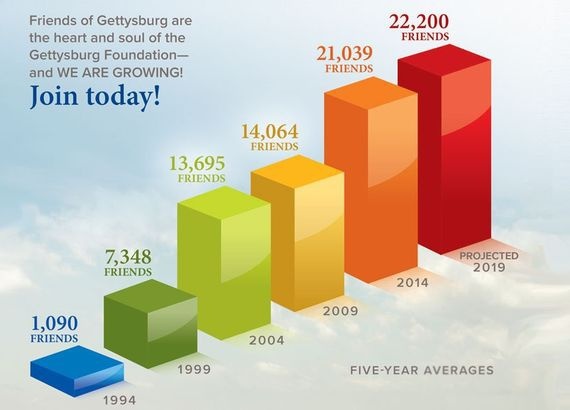 Donating over $1 million to support the Gettysburg Foundation’s robust mission. Volunteering nearly 10,000 hours through battlefield rehabilitation projects, clerical duties, visitor services, managing the Friends desk, and several other critical jobs throughout the Gettysburg Foundation and Gettysburg National Military Park. Attending several educational events including Spring and Fall Muster, Encounters With History programs, Volunteer Workday, and exclusive First Corps only events. This momentum will only build in 2018. The Friends will provide funding for the rehabilitation of Little Round Top, participate in the Volunteer Workday and Friends events, and strive to move the Foundation’s new strategic plan forward to further engage Americans in Gettysburg’s broader story. The Recruits, Friends aged 18-40, will celebrate the one-year anniversary of the Spangler orchard, bottle their newest batch of Rose Farm Orchard cider, and continue to host GETT TALKING events—their new live-streamed educational initiative that encourages an open and honest dialogue about some of the country’s most controversial topics. To join the Friends, please visit our website or contact the Friends department at 717.339.2156.